Men's 5.5 oz. 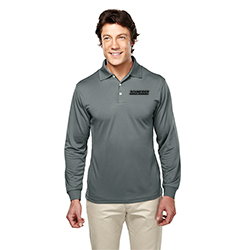 100% polyester pique long sleeve golf shirt featuring the UltraCool(TM) system to control and manage perspiration. Constructed with a three-button placket, mesh side panels, and ribbed cuffs. Half-moon yoke back and square bottom with side vents.